After weeks of my mother-in-law’s most delicious Spanish food, we came back to Oxford, and back our normal life. ‘What should we eat?’ Having no need to cook for such a long time, I ran out of cooking ideas. “Tofu, then.” – We almost said at the same time. If one thing we really miss when we haven’t had Chinese food for a while is is tofu. So we rushed to the Chinese shop, and bought a few different kinds of Tofu. This dish is something I kind of improvised, as in North East China we don’t have the exactly same kind of dried bean curd as the one we bought in the Chinese supermarket in Oxford. The bean curd we use is called Su ji in Mandarin. Cantonese-style dried bean curd is around 0.8cm thick and in the shops over here they are come in square shape. Su ji literally means vegetarian chicken. Northern ‘Suji’ is different to Southern Suji: northern Suji normally comes as a block and its taste is a bit savory taste, whereas southern ‘suji’ is more like ‘layers of dried bean curd sheet pressed together’. But ‘Suji’ and dried bean curd share similarities in terms of textures and taste, they are normally ready-to-eat, so whenever I am making it, I really can not help ‘stealing’ a little bit. It is ideal for making salad / liangcai, and of course can be stir fried as well. In North East China, it is normally stir fried with vegetables (such as green pepper or Chinese leaves). Cantonese-style dried bean curd usually comes in two different flavors, one is plain, another one is with seasonings like five spices. They both are good for this dish, I only found the latter one in my shopping trip. Dried bean curd can be a bit heavy and filling. But it is healthy, and when cooking, it does not require much oil for frying, so it is a really good dish for boasting your daily protein intake. Although dried bean curd can only be found in some far east shops here, you can also use tofu (or braised tofu ), which is sold in many supermarkets here. They are drier and way more firmer than the fresh ones. I always think that that those kinds of tofu are not suitable for the dishes I talked about before, but for this dish, it is good. Anyway, here you go, the recipe. 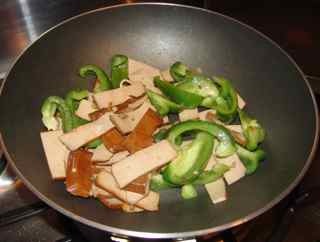 Dried bean curd (or tofu sold in normally supermarkets, they are normally sealed well, and have very long expiating days ), green pepper. Garlic, oil, salt, light soy sauce (optional, especially if you use flavored dried bean curd, you don’t have to use soy sauce). 1）Slice the tofu into thin pieces, then cut them in half again. 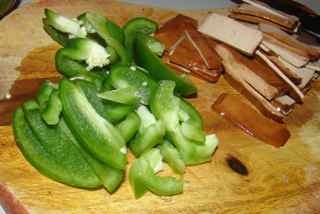 2）Chop a green pepper into strips. 3）Chop around 3 gloves garlic into small pieces. 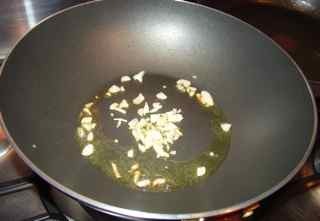 1） In a heated wok, pour in around 2 tablespoons of oil. 2） When oil is hot enough, add the garlic pieces in. 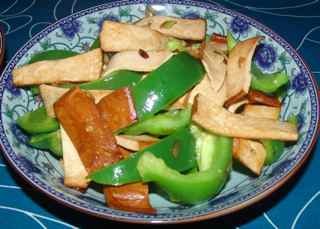 3） When you can smell the garlic, add in prepared green pepper and dried bean curd (or tofu), stir everything together. Every quick and easy, no? The green pepper doesn’t need to be soft, it is probably better to keep it fresh, crunchy and juicy, the taste of green pepper will match well with dried bean curd / ‘Suji’ / tofu. Rice dishes are good to go with it.